The 9th Michigan, had been busy rounding up stragglers for several hours. However, nobody would take command of the small force he had assembled, including Major General Crittenden, commander of the Twenty-First Corps. At about this time, Colonel John Parkhurst, commander of the 9th, ordered his men back up the Dry Valley Road toward McFarland Gap. Johnson’s Division and Anderson’s Brigade are deployed for their attack. Anderson must deploy in a double line, since the interval between Johnson and Kershaw is smaller than his brigade front. The 9th Mississippi Sharpshooter Battalion is skirmishing in front. Steedman’s division arrives behind Snodgrass Hill. 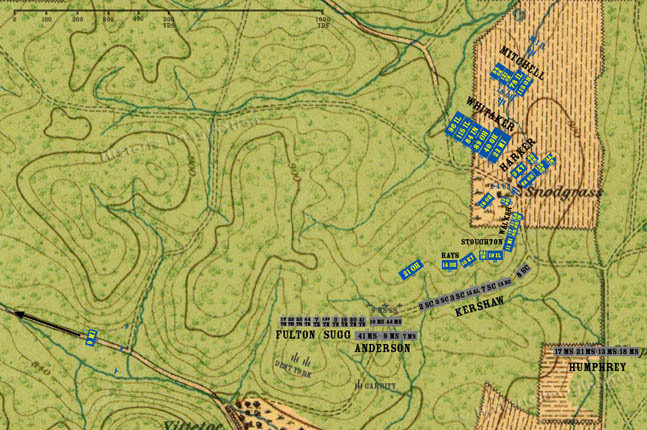 Stanley’s brigade deploys on the crest of Hill One, but the 18th Ohio remains behind in reserve.